Due to the "Blogging Day of Silence" yesterday for Sandy Hook Elementary I am a little behind on my 12 Days updates. Who am I kidding - I was behind anyway :-) So today I am going to do 3 different days in one post and then Day 9 in a new post. Day 9 is a very special day so it deserves it's own post. Just wait until you see what we did for Day 9!!! My favorite!!!! The most obvious lesson to come from these books is a sequencing activity. I found a super cute one (after browsing through multiple freebies). You can get it HERE. It comes from Bright Concepts 4 Teachers. It also has a writing component with a SUPER cute way to publish it. Check it out! 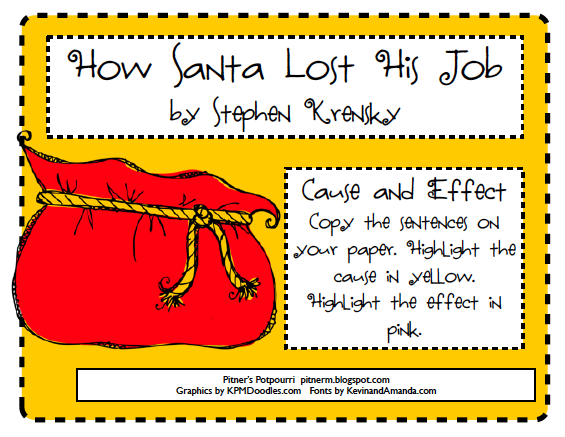 I also loved this FREEBIE (below) that I found on TpT. I thought this was a quick, easy way for younger students to grasp one part of Author's Purpose. This comes from Rebecca Wrenn. This is actually a free portion of her more complete Book Study. I didn't use that this year, but I might have to check it out for next year. 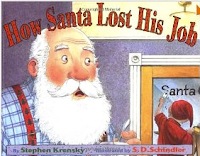 This is a super cute story that helps kids imagine that Santa was once a young man who was looking for a job just like anybody else. 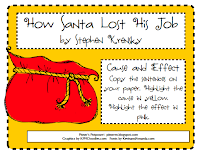 With each small job that he had he found out something about himself that led him to his final job - Santa Claus. 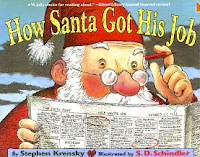 It was so fun to read this and stop after each part to ask kids how that job will help him with being Santa. 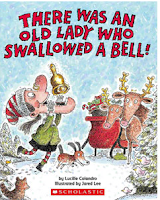 Very fun read aloud! 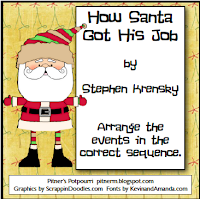 I found this cute freebie that includes two activities - sequencing and cause and effect. This would be too difficult for first grade to do independently, but you could use these activities to help teach a whole group lesson. Click HERE to check them out. 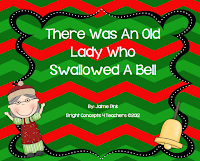 You will find this freebie on Pitner's Potpourri blog. Enjoy this next round of read alouds!